What follows are a few books that we highly recommend each person read for the sake of spiritual growth and discipleship. Of course, the Bible goes without saying and is the book we should spend time in every single day and throughout every single day (reading, studying, praying, meditating, and memorizing). There are also many other great resources, though, that can help in both your understanding of God’s Word and in your application of God’s Word. 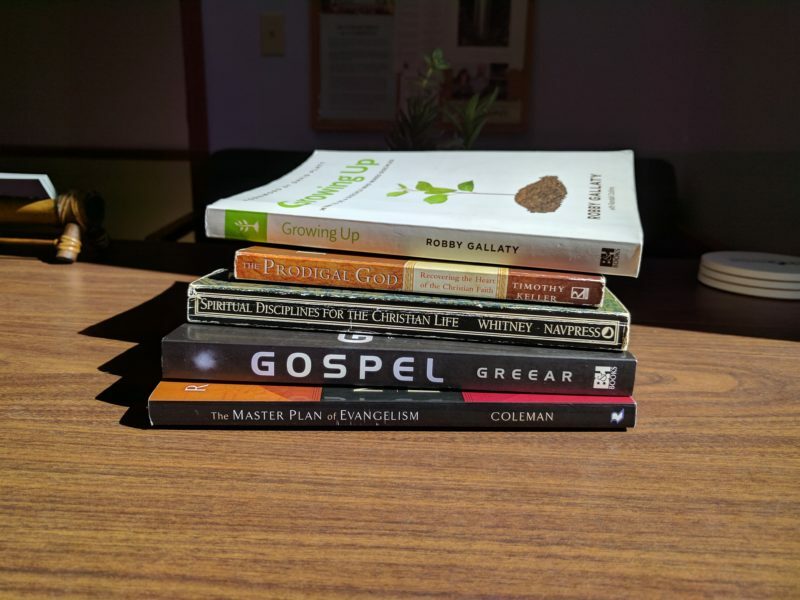 The books listed here do not comprise an exhaustive list but rather are books that we recommend because they are being used in discipleship accountability groups in our church family and/or because they go along well with the current sermon series or Bible studies. 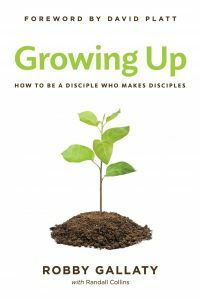 Used by our weekly discipleship accountability groups (DAGs), Growing Up is a great resource that we recommend to every believer who is serious about being a disciple who makes disciples. And, for those who are not yet serious about this essential task, we recommend you read it and get serious. Practical, challenging and easy to read, Growing Up provides you with an interactive manual and resource for creating and working with DAGs, allowing you to gain positive information both for yourself and for others as you learn how to help others become better disciples for Christ. If you are serious about being a disciple of Jesus Christ—really, truly serious—a DAG can help you achieve that goal. Jesus established this model for us by forming and leading the first discipleship group—and it worked. The men who emerged from that group took the gospel to the world and ultimately laid down their lives for Christ. DAGs can create an atmosphere for fellowship, encouragement, and accountability—building an environment where God can work. In Growing Up, Robby Gallaty presents a practical, easy-to-implement system for growing in one’s faith. This guide offers a manual for making disciples, addressing the what, why, where, and how of discipleship. D-Groups, as Gallaty calls them, can teach you and others how to grow your relationship with God, how to defend your faith, and how to guide others in their relationships with God. Pastor Nick is currently preaching through a sermon series on Sunday mornings called “Habits for Godly Living.” Covering eight of the biblical disciplines for the Christian life discussed thoroughly in Donald Whitney’s book, Nick recommends everyone read this book, too. It’s not uncommon for an accomplished musician to be able to sit down in front of a new piece of music and play it though without a hitch. It seems easy, as if playing required no effort. Yet, the ‘freedom’ to play with such skill comes only after years of disciplined practice. In the same way, the freedom to grow in godliness–to naturally express Christ’s character through your own personality–is in large part dependent on a deliberate cultivation of the spiritual disciplines. Far from being legalistic, restrictive, or binding, as they are often perceived, the spiritual disciplines are actually the means to unparalleled spiritual liberty. 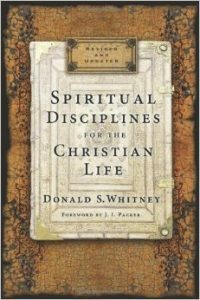 By illustrating why the disciplines are important, showing how each one will help you grow in godliness, and offering practical suggestions for cultivating them on a long-term basis, Spiritual Disciplines for the Christian Life will provide you with a refreshing opportunity to embrace life’s greatest pursuit—the pursuit of holiness—through a lifelong delight in the disciplines. If you are interested in purchasing this book, you can let us know and/or click on the picture of the book. We can likely get you a discounted rate if you are interested, though, and still have a few copies available for purchase ($10) in Nick’s office. 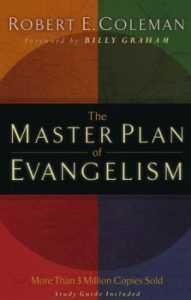 Currently being used by our Wednesday night adults’ prayer and Bible study group, The Master Plan of Evangelism is an excellent resource not only for proclaiming the gospel but also for discipleship in general. While our Wednesday night study will end before summer, we recommend everyone read this book on your own. For more than forty years this classic study has challenged and instructed more than 1.5 million readers in reaching the world for Christ. With a foreword by Billy Graham and now repackaged for a new generation of readers, The Master Plan of Evangelism will show every Christian how to minister to the people God brings into their lives. Instead of drawing on the latest popular fad or the newest selling technique, Robert E. Coleman looks to the Bible to find the answer to the question, What was Christ’s strategy for evangelism? Through a thorough examination of the gospel accounts, Coleman points out unchanging, simple, yet profound biblical principles of how to emulate Christ to others. If you are interested in purchasing this book, you can let us know and/or click on the picture of the book. We can likely get you a discounted rate if you are interested, though, and still have a few copies available for purchase ($5) at our church facility. Although not a part of any current weekly studies, Gospel is a book that was transformational in Nick’s life and one he recommends every believer and truth-seeker reads. You’ll laugh at author J.D. Greear’s great stories and be compelled by his explanation of biblical truth. Could the gospel be lost in evangelical churches? 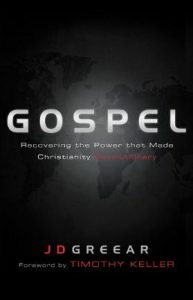 In this book, Greear shows how moralism and legalism have often eclipsed the gospel, even in conservative churches. Gospel cuts through the superficiality of religion and reacquaints you with the revolutionary truth of God’s gracious acceptance of us in Christ. The gospel is the power of God, and the only true source of joy, freedom, radical generosity, and audacious faith. The gospel produces in us what religion never could: a heart that desires God. The book’s core is a “gospel prayer” by which you can saturate yourself in the gospel daily. Dwelling on the gospel will release in you new depths of passion for God and take you to new heights of obedience to Him. Gospel gives you an applicable, exciting vision of how God will use you to bring His healing to the world. You won’t regret taking the time to read this practical, challenging, encouraging and easy-to-read book. You can order it online by clicking on the picture of the book itself and also through many other websites and bookstores. A book that our Wednesday night adults’ prayer and Bible study group went through a couple years ago, The Prodigal God is an amazing resource that will challenge and sharpen your faith in powerful ways. Next the the Bible itself, this is probably the most influential book Nick has ever read. He can’t recommend it enough to every single person, Christian or not, who is willing to read it. While author Timothy Keller is brilliant, his writing is easy to read and practical for every person searching for truth and wanting to have a closer relationship with God. Newsweek called Keller “a C.S. Lewis for the twenty-first century” in a feature on his first book, The Reason for God. In that book, he offered a rational explanation of why we should believe in God. 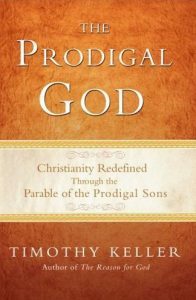 Now, in The Prodigal God, Keller takes his trademark intellectual approach to understanding Christianity and uses the parable of the prodigal son to reveal an unexpected message of hope and salvation. Please take the time to read this incredible book. You can order it online or find it in many bookstores. Author Nik Ripken recalls that, “God had always been so real to me, to Ruth, and to our boys. But was He enough, for the utter weariness of soul I experienced at that time, in that place, under those circumstances?” It is a question that many have asked and one that, if answered, can lead us to a whole new world of faith. 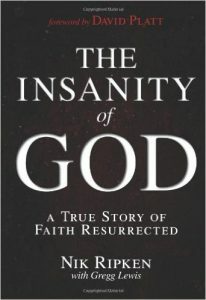 While not used for a Bible study at Richland, Pastor Nick has referenced The Insanity of God multiple times, as the stories told in this book are amazing and unforgettable. You will be overwhelmed in a spiritually uplifting way if you will commit to reading this book. Find it online or in bookstores. If you have any questions about any of the above books, please contact us or see Pastor Nick. Note: Book descriptions are from Amazon.com, except for Spiritual Disciplines for the Christian life, which is from biblicalspirituality.org.